he mission of the Florida Archaeology program is to conduct research on the extensive history of human occupation in Florida and adjacent areas through field investigations and analysis of curated materials. We emphasize student training and collaboration, the use of legacy collections, publication, and outreach. For more than seventy-five years the Florida Museum of Natural History has served as a repository for collections and information on the archaeology of Florida and surrounding regions, especially the Southeastern United States and the Caribbean. Nearly 2,000 archaeological sites are represented in the collections (more than 1,500 in Florida). The Florida Archaeology Collections are primarily from Central and North Florida with some from the Panhandle region. All counties including and north of Sarasota, De Soto, Hardee, Polk, Osceola, and Indian River counties are included in this collection. The Bioarchaeology holdings include remains from sites throughout the state. Map of counties included in North Florida Archaeology holdings. Exceptions to this rule are sites situated within Colonial St. Augustine and historical sites with no pre-Columbian material present; collections from these locales are included in the Historical Archaeology Collections. 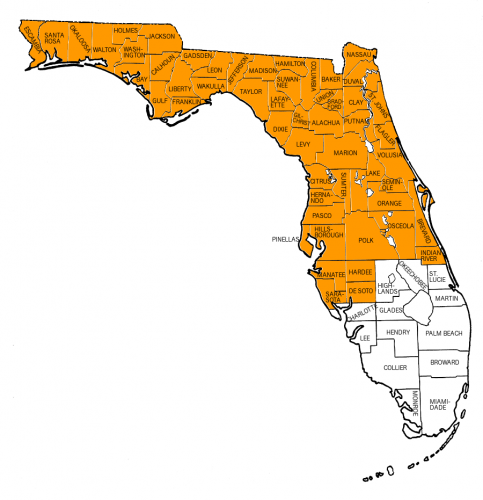 Counties to the south are part of the South Florida Archaeology Collections. It is recommended that scholars wishing to use the collections and associated archival materials first contact the appropriate collections manager for information.